Steel-belt wire, a sure way to get a tire flat. 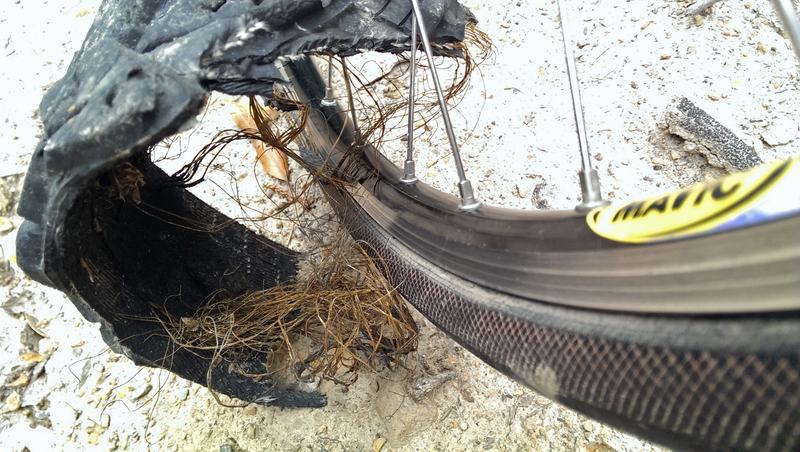 Third in line after glass and puncture vine, I claim wire from steel-belted tires to be a source for bike tire flats. I had one of those a few weeks ago and it’s a hassle to remove the tiny wire. I had to add a boot and extract it at home. I used to think the wires came from street sweepers, but someone told me it was car tires. It’s hard to believe, but I told myself I’d stop and take a photo if I came across a tire shred. Sure enough on Saturday I found some on Summit Road just south of Gist Road. How it got there is a mystery. Maybe it fell off a truck carrying junk. I checked out those little-ridden roads nearby, Schulties, Redwood Lodge, Morrill Cutoff to see if they survived the winter; they did, with a couple of minor mudslides and downed trees, since cleared. Finally, Sempervirens Fund celebrated its 116th anniversary Saturday at the new parking lot for Castle Rock State Park. I was passed by a phalanx of cars heading up Hwy 9. I figured some event must be underway because traffic was far worse than normal. When I mentioned this to a woman at the parking lot entrance she claimed it was just weekend traffic. We should all be thankful that so few people recreate in the Santa Cruz Mountains. Even a minor increase in traffic triggered by a special event overloads mountain roads. This entry was posted on May 15, 2016 at 6:10 pm and is filed under Ride reports. You can follow any responses to this entry through the RSS 2.0 feed. You can leave a response, or trackback from your own site. Those tiny strands of steel from tires have given me flats as well. They’re hard to find so I carry powerful reading glasses when I ride. I read a tip in a bike mag that suggested carrying a cotton ball to run on the inside of the tire to locate those tiny buggers. All those little back roads that used to feel eerily remote are now packed with cars (at least on the weekends). Guess this is the new normal.